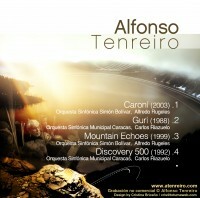 Alfonso Tenreiro’s music is deeply grounded on Western traditions, from Gregorian Chant, Renaissance and Baroque Polyphony to Romantic harmonic and melodic esthetics. This he does with an updated resource of modern techniques, including free chromaticism and atonality, primitivism, polytonality, and brush strokes of Venezuelan folklore. His latest piece Remembrance was commissioned by Janice Pellar, an LSU School of Music alumni. In Remembrance Tenreiro is influenced by all of the above. The piece begins with a contemplative monophonic melodic line in the violins, which later develops and gets tossed among different woodwind solos. As the piece progresses, the triplet accompaniment figure introduced by the brass section of the orchestra is used as a developmental tool throughout. This rhythmic triplet pattern becomes the foreground for the next few measures serving as a link to the folk like Merengue Venezolano melody presented by the trumpet. The Merengue Venezolano is a rhythmic pattern of folk origin from Venezuela in either 5/8 or 6/8 meter. What distinguishes the Merengue is the overlapping of 3/4 against 6/8 meters. The Romantic influence in the melodic material during the development of Remembrance is latent, and it is also contrasted and juxtaposed with the rhythmic and melodic patterns of the Merengue. A harp solo followed by a piano solo lead to an intense fanfare coda, this way rounding up the piece. Throughout this work there prevails a spirit of contemplation with feelings of nostalgia, memories, admiration, wonder. This composition has a tonal character, resting on harmonies and Romantic passages. The scarce use of percussion and piccolo, and the absence of the piano are clues of Tenreiro’s return to the roots of Western Music. The orchestration is very profound. In it the composer searched for the natural resonance of the orchestra. In this piece Tenreiro opted for not linking the themes through bridges and transitions. Each melody is exposed and recapitulated almost immediately, without the work deviating from the point it tries to communicate. The beginning of the work is of melancholic character and, little by little, upon presenting the Gregorian theme, the character turns festive, giving the Moravian Philharmonic Orchestra conducted by Vit Micka the full opportunity to shine. 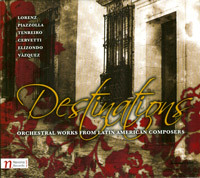 The CD Destinations was produced by Navona Records. 2005. This work constitutes a landmark in the musical creation of this Composer. 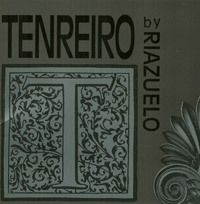 It is a piece different from all of Tenreiro’s previous ones. In composing it he wished to go back in time 100 years and take it from there. “I feel that harmonic direction has not been developed enough. I wanted to place myself where Schöenberg started out. In this piece I consciously took a different path than that of the Second Vienese School. I think I accomplished it without sounding like the composers of the Romantic period”. “One morning while driving I was composing something, inspired by the mountains, the serenity of the area, the awesome view, and I thought I would like to write what I was imagining, wishing someone would commission this piece which was coming forth from my interior. 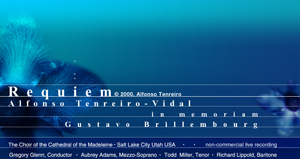 The possibility arose to participate in the Utah Arts Festival, in which the Composer of Year 1999 would be chosen. I won the contest and they commissioned a work, which was precisely the one that was coming forth from me through nostalgia from my Venezuelan mountains and admiration of the ones in Utah”. Commissioned by a Venezuelan aluminum producing company (ALCASA) for the celebration of its 25th Anniversary. I wished to bring out in this work the contemporainety of aluminum. In the beginning slow section the main melody is introduced by the french horn. As it is harmonically intensified, this section reaches a climax that becomes explosive and then returns to the initial serenity. The allegro section starts with the marimba and xylophone in a happy and joyous, yet rhythmically conflictive passage. The work closes with a majestic finale. The musical ideas in this symphonic work express the perception that the Composer had of a lady of his times. It starts with a melodic theme in the flute echoed by the piccolo. This theme can also be heard in the fugal passages of the strings and in the more dramatic brass section. The traditional elements are enhanced by an atmosphere of great rhythmic and dramatic density. This work was commissioned by Mrs Clara Tamayo de Brillembourg. 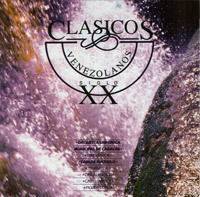 This symphonic work which carries the listener towards the interior being of Jose Antonio Paez, a Venezuelan Independence hero and several times President of the country,. was especially commissioned for the Bicentennial of his birth. It expresses what might have remained in the memory of Paez, the “Centaur”, at the end of his life. Hence the melody is at the same time lyric and painfully darkened by dissonant orchestral colors. The musical material works to create an atmosphere of ambiguity and leaves the listener in a calm that is rather pensive. This work envelops the listener in an environment of mystery and takes him through a journey in which one can admire the beauty, tranquility and greatness that is Guri. GURI is IMMENSITY: The deep interior silence felt in front of the great concrete mass that is Guri Dam is expressed in this music work with atmospheres of mystery, of surprise. GURI is the LAKE: Behind the enormous wall an immense lake is formed. The vision of the lake produces a sensation of calmness, of peace, that is translated in the music with an atmosphere of serenity. GURI is the STRENGHTH OF THE WATER: The immense mass of water that descends through the dam’s spillway produces a turbulence and a physical and sonorous strenghth, that the Composer engraved in this symphonic work. He imagined also this turbulent mass of water as reduced to acoustic particles. Composed by Alfonso Tenreiro, 1988. This is a short piece for Oboe, Trumpet and Strings in which the lyric solos of the oboe and trumpet interact with the transparent harmonies in the strings. At the same time the oboe and trumpet are in echo and counterpoint with one another. This work envelops the listener in an atmosphere of tenderness and serenity. It was composed under the patronage of CONAC.